In my world food has always been the perfect medium for bringing together complete strangers. No matter your roots, where you folks came from, the color of your skin or even your religious affiliation mattered when breaking bread together. Needless to say being out of the kitchen ever since I embarked on my trip was getting to me. Not having to cook any of your meals was a heaven, but deep inside my inner chef wanted to come out to play, and play badly. During my stay in Chiang Rai, Thailand I took care of that ever persistent monkey on my back by enlisting in a Thai cooking class. Nickle, a rad fella from Australia that I met in Chiang Mai and traveled together to Chiang Rai, signed us up for Akha Kitchen with Chef Jaruwan. After a few emails, WhatsApp text messages, we were in there like swimwear, and were to be picked up early the following morning. A big draw of Chef’s cooking class was the chance to actually GO TO THE MARKET. Back in the states you wouldn’t have been able to do such a thing, rather show up onsite and start chopping away. 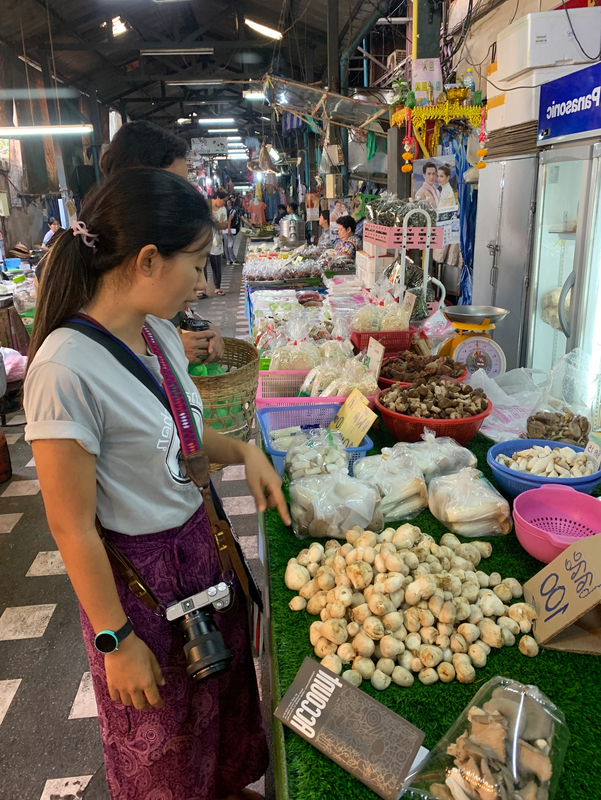 During our visit we picked up all the ingredients needed to make our traditional Thai/Akha menu that we decided on day prior. You could tell Chef was a regular in this market; which meant ever so often we stopped to nibble on almost anything she got her hands on. The vendors dove right into deep conversation of their produce’s origin, health benefits, and why/how it was used in dishes with us. The interaction with the vendors was priceless to us, Nickle being the son of a chef himself and loving to cook. With our grocery list checked off, bellies lined of fruit nibbles, and pouches full we made way towards a tuk-tuk and headed to Chef’s kitchen. At headquarters was Akha Kitchen’s two sous chefs awaiting our plentiful offerings. As they took the pouches off our hands to get them prepped Chef sat us down for some tea and pineapples. While we waited for the sous chefs to finish up we chopped up about where we came from, our cooking backgrounds, family stories, and what drew us to the class. Through this we found out Chef was part of the Akha tribes’ people that fled into northern Thailand over the last few hundred years. 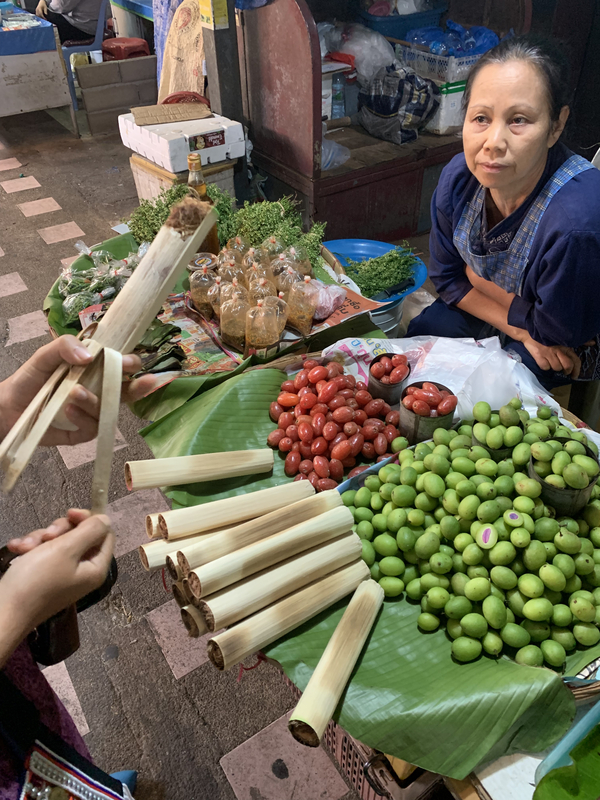 Their food meshing into the already standard fare being offered, but retaining just that bit of what made Akha food Akha food. Let me also mention that the tea was amazing when I didn’t spill it on myself! Just a two man team so the class was more intimate than usual. Perfect in my book. The class format was as follow: final prep of the ingredients, cook the dish, and then devour its entirety. Wash, rinse, and repeat for following courses. I was hesitant on this format at first, thinking we would get too full along the way. But it made for a much more streamlined process. No one wanted to eat cold food while waiting for everything to finish cooking! NOTE: Akha’s kitchen is very well maintained, actually the entire house was. Everything was new, orderly, and every bit an industry kitchen for mass consumption was to be. But it still felt VERY HOMEY. It was like cooking in your own kitchen at home halfway around the world. Everything you need for your perfect curry paste. We started off by making our own green curry paste. This meant we were picking our own level of spice, mine will be ATOMIC of course, and grinding the ingredients into the creamy paste you can only achieve with making it by hand. Bye-bye forever to the pre-made store bought junk! Once the consistency was achieved we set this aside for use in our chicken curry, boy was I hungry for that already. I will note that mine smelled POTENT. Cooks just talking about their favorite dishes, flavors, and why they do what they do. Spicy Sapi Tong was an Akha specialty which we tackled this next. Think of it as guacamole dip, but more Asian than Mexican and definitely SPICIER. This small dish was quick in prep and even quicker when being devoured. Fresh cucumbers and cabbage was used as a vessel to transport the dip into one’s mouth. I loved using the cucumbers as it provided a cooling after taste for all that flavor bursting from the dip. Cabbage had a nice crunch to every bite and its raw, bitter flavor contrasted nicely with the fermented notes that one’s tongue picked. Needless to say I ran out of cucumbers and cabbage quickly. Pad Gra Pow is stir fried pork with Thai basil and garlic so you know our next meal was going to be extremely fragrant. With the final prep done we came over to the kitchen where our woks awaited us. This was one meal Nickle was looking forward to making the most, as he hasn’t eaten it ONCE since landing in Thailand! I tossed in my pork and listened to it sizzle away, cooking faster than one anticipated with the hot wok. Soon after went in the basil and garlic, the smells emanating from the wok reminded me of the kitchen at my own restaurant. The monkey on my back is now subsiding its devilish tendencies. Naturally I threw in a few flick of the wrist while handling the wok, like a true amateur, and the deed was done. Our pork was plated next to sticky rice, another one of Nickle’s favorite, on a banana leaf. This made for a beautiful, yet simple presentation much like how we were going to consume it. The color contrast was very pleasing to the eye, but I was more interested in how it tasted with all the extra peppers I tossed in! A spoonful of pork coupled with the rice soon found its way into the last bit of light it’ll ever see. Goodness I just love the pairing of basil, garlic, peppers, and PORK. No one talked much, showing how good the outcome was. The plate was cleaned off quite quickly. Tom Yum Goong was my pick and thinking about it got me salivating at the mouth. This tom yum is NOTHING like that you find back in the states. First of all we used jumbo river prawns, something kind of a big deal in Thailand, and for good reasons. Secondly the blend of spices and the hint of coconut milk didn’t overpower any of the other flavors in the soup. Lastly we kept the heads of the prawn ON while cooking. A lot of western places will get rid of this part because it is unsightly, but not here! The head is where the entire flavor comes from so naturally we kept these on and boy was I happy we did! Forewarned if you eat things with heads on around me I tend to go in hard on them! Next we moved onto the chicken green curry, probably the longest to cook of all the dishes that day. We grabbed our paste we made in advance and headed back to the wok. At this point I was a little bit full in the belly, but was not in any means throwing in the towel just yet! The chicken breast went in first, I would have much like to use dark meat chicken, but time was of the essence as they took longer to cook. This was followed by our curry paste and a heaping helping of coconut milk. While it simmered we contemplated the perfect time in which to toss in our eggplant, a few more minutes Chef would mention to us. I wanted it all now. The curry started to break down I could tell Nickle’s excitement was building. We have had green curry a few days prior, in Chiang Mai, which he walked away being immensely unimpressed by. It was by my recommendation too, so you see I wanted to rectify this and be back in his good graces. The smells were getting intense, my nostrils were inflamed in all the right sense of the word. The thicker it got the darker in color it became, and the more fish sauce I wanted to add, ha. A little bit of coconut milk here, a pinch of sugar, SOME salt and viola we were done! Carrying it over to the table you could tell Nickle couldn’t wait to dig in. My only hopes was that this would be a much better fare than that disappoint from a few days ago. The moment of truth came as he dug his utensil in and moved the vehicle towards his agape mouth. A few chews, some loud smacks of the lips, and a grin appeared ear to ear. “MAN THIS IS SO MUCH BETTER THAN THE OTHER NIGHT!” he exclaimed to me. Deep inside I felt all was right with the universe again. FINALLY it was onto dessert! I couldn’t wait to top off the meal with some sweet pumpkin in coconut milk. I have a sweet teeth that hits once every blue moon and Buddha knew it was said blue moon. Our final pots were prepped as we made way into the kitchen for the last act. Set to med-high the coconut milk simmered away while we waited to toss in our sweet pumpkin. Turn the heat to high and let it boil for a few minutes under a watchful eye. You don’t want to lose it all in the homestretch now! I will be the first to tell you how incredibly refreshing this last dish was! The coconut milk really softens and creates a melt in your mouth texture for the pumpkin. I could hardly put my spoon down. Only until I realized my bowl was empty, my stomach full, that I had lowered my eating utensil, in sadness I might add. I can’t recommend doing a cooking class in the country you’re visiting enough. It will be one of the greatest connections you’ll have during your stay abroad. 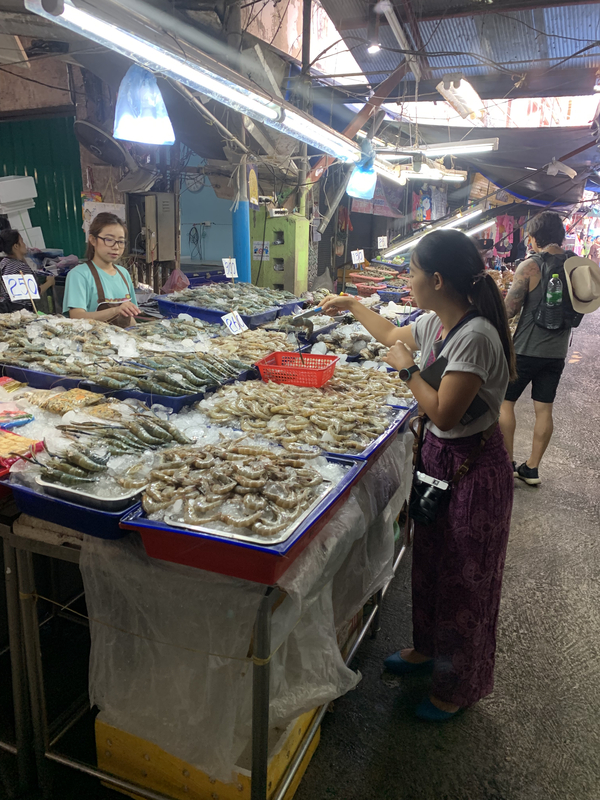 Find one in which you can go to the market, converse with locals, cook with someone whom lives there, ask questions, trade stories, and bond over a great meal. You’ll thank me later for this. Thank you Akha Kitchen for putting up with us!